Broken, alone and buried in a house full of junk and shame, Eddy Gilmore takes the “normal” route out—institutionalized learning. But when college life fails to offer meaning, the young man reaches a turning point, a point at which he abandons social norms, abandons the status quo, and strikes out on his own. A lifetime of adventure packed into a nine-month “gestational” period awaits: face-to-face encounters with wildlife, a devastating monsoon, a magical winter near the Canadian border, the kindness of strangers. Gilmore’s quest for knowledge and wisdom through experience, adventure, faith, and books will engage you as the author comes to fully experience the world for the first time. This was a truly captivating read. 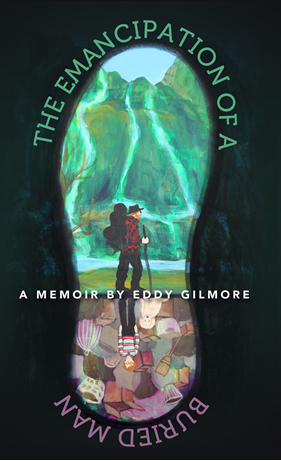 Eddy paints a vivid picture of his childhood, and the unconventional way his life was changed. I felt like I went through the whole journey with him. It’s a beautiful story, and I’m grateful he chose to tell it. Even since finishing the book, I still find myself thinking about it. I would absolutely recommend it! That Gilmore emerges from his childhood a sober and healthy person is testament to the strength of the human spirit. I trust you’ll find his story as memorable and inspiring as I do. This memoir is skillfully crafted into 2 diametrically opposed sections, appropriately titled “lost” and “found.” The cover art perfectly illustrates the idea. From the depths of hoarding to some of the most exhilarating wonders of the continental United States, as a reader, I was caught up in the grace and adventure. As much as the mountains of ‘stuff’ in the first half of the book make one cringe, traipsing through the valleys of the great national parks on the west coast makes one’s heart thrill. Eddy Gilmore captivates his audience from the first sentence of his story to the last……he exquisitely leads you through each chapter with such brilliant detail the reader is immersed into the story, celebrating each success and mourning each loss right along with him. Check out this amazing review from a book blogger in England. I write articles for two local magazines: Positively Superior and Duluthian. Contact me to write your story! This winter I’ll be focusing on my next book. Stay tuned.